How Long Does It Take to Get Certified as a Medical Biller? Coach Laureen: Let’s go to the next question here. 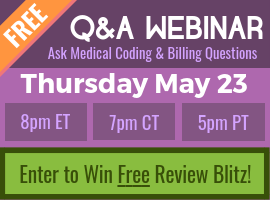 How long does it take to get certified as a medical biller? As you can see, all the competencies that we try and cover in the medical billing course, it’s similar to our medical coding course. It takes about four to six months to get through the content. That’s with the student on average doing eight to ten hours of homework a week. Our courses last nine months so that you can have a little cushion there. But even if you run out of time, so to speak, you can easily extend with us for less than $20 a month. That’s the average. Coach Chandra: We have a question come in related to that saying, “I’m a medical biller. I handle some coding. Would I need to get the CPB or would a CPC be sufficient?” Do you want me to answer that one or do you want me to… So as a biller, quite frankly, you could do either first. However, I don’t understand how you can take the CPB exam without really understanding the coding first. I know some people have, and they’re a biller and there is less coding on it. But the coding questions they can ask you still run the gamut. I’m still a big proponent of – and I believe Laureen’s the same way – that CPC being your base credential in most situations. When it comes to coding and billing, I’m still a big proponent that your CPC is going to show you really know your stuff from a coding perspective. Yes, the billing comes in handy and helps you in proving that you know, or demonstrating that you know the billing regulations and the differences between payers and all of that sort of thing. But I would tend to encourage you to get your CPC first before you go after that CPB. Coach Laureen: I agree wholeheartedly. Hi, I’m an BSN-RN and work for an insurance company. They often have positions in the claims department but require coding. I have wanted to obtain certification. My question is; being an RN are there courses that I would be eligible to clep or Test out of ? i.e. Anatomy, Medical terminology. ? No, there aren’t, but you’ll breeze through them I’m sure! By the way, we’ve received similar questions in the past. This one is from the old forum and this blog post was written by a Nurse that shifted toward Risk Adjustment.